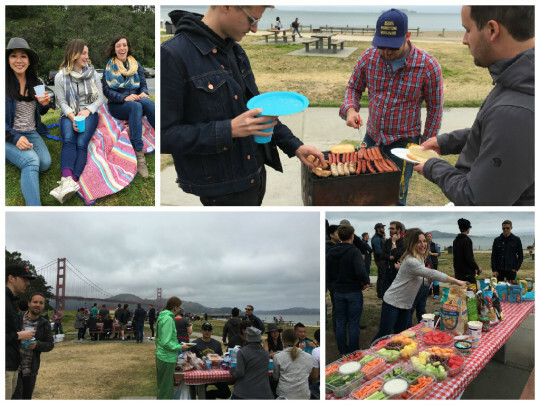 Earlier this week, we hosted a good ole fashioned company BBQ at Crissy Field in San Francisco - it was about time that we brought the team together for a little fun in the sun fog! We went back to our roots for this one - grocery shopping for grillables, drinking soda pop and a pony keg of “Moderation” (a homebrew from our very own James Greenhill and Ted Kaemming), and hosting a bake-off to supply ourselves with an insane amount of sugary deliciousness. It was great to chill by the grill (literally - it wasn’t exactly warm), play lawn games, and spend some time just decompressing with each other. We’re a fun-lovin’ little community over here, and it’s nice to have a reminder of how much we like each other! We started the day off with some bagels and coffee, to fill our bellies and warm us up (did I mention it was cold?) before a teambuilding activity to get us all talking. We worked with a company called RoundPegg to take what are basically workplace-values tests...like a Myers-Briggs but specifically about how we like to work. Then we circled up for “Speed Dating” - interviewing each other about our preferences and work styles. It was really interesting to dig a little deeper, to ask specific questions about how we’re different and learn how to use those differences to our advantage. One of our company values is being colorful, which to us means celebrating what makes us unique, and using our differences in perspective to be better together. Once we wrapped up our Speed Dating sesh, it was time to fire up the grills! 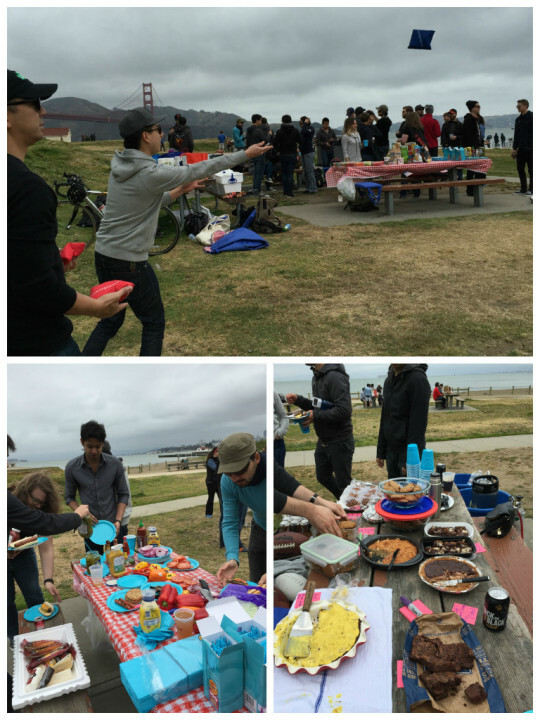 It’s always nice to keep things low key, and we’re a pretty scrappy bunch of folks, so we had no trouble at all grilling up a storm. From hot dogs and sausages to vegan-friendly burgers, not to mention a vast assortment of sides, we were well fed. There was definitely a lot of eating, but we also played all sorts of games - corn hole, jai alai, football, and a new favorite...3-second animals (players have 3 seconds to draw an animal of the judge’s choosing). It was great to take a day away from the office to just hang out and enjoy each other’s company. In addition to our spread of BBQ and snacks, we enjoyed an assortment of homemade treats from Disqussers Steve Roy (chocolate cherry cream pie), Amanda Nudelman (dog flops), Tony Hue (s’mores brownies), Jeff Pollard (banana cream pie), Branden Rolston (oatmeal spice frosting sandwiches), and yours truly (kitchen sink cookies and peach cake). It was a true team effort! I love taking the time to connect with each other off-line, IRL, and away from the craziness of our regular days. It’s good to shake things up, bond with each other, and come back to the office feeling refreshed and reconnected. Teambuilding FTW!